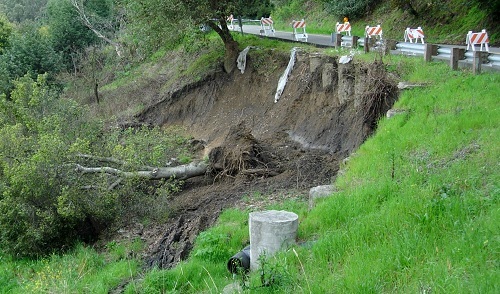 Landslides are widespread in the Bay Area by the end of wet winters like this year’s rainy season. They range from minor disturbances like these to large, ancient movements that awaken in the wettest years. All photos by Andrew Alden. Every rainy season this happens: Bay Area homes are threatened by ground movement. While each landslide that damages someone’s home is a tragedy, as a general phenomenon landslides are interesting. So first let me commiserate with landslide victims; I’ve suffered land displacement in my home too. It’s no fun dealing with the upheaval, the neighbors look askance and worry about their own situations, and things are even worse when lawyers and the news media get involved. And now I’d like to show you some landslides and help you recognize their signs and symptoms. Landslides can result from human misjudgement, but they also occur on their own, quite naturally. It’s usually hard to tell the difference or assign blame. The state licenses geologists to ensure that the right expertise is available. In any case, I am keeping the locations anonymous. Landslides happen when gravity overcomes the natural cohesion of a slope—the slope becomes too steep, the material becomes weak, or (usually) a combination of both. In the Bay Area, streams dig downward, earthquakes push the hills upward, and they reach an uneasy balance. At that point landslides are inevitable, and we can talk about the specific changes that cause them, natural and artificial. Natural ones include changes in long-term climate and short-term weather. 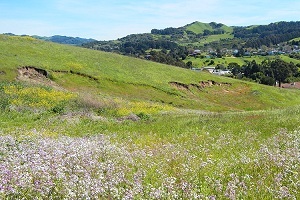 Artificial ones include oversteepening slopes by excavation and land-use changes that alter the groundwater. Here’s an example, a slump, with a clearly artificial cause: A road has been cut into and built out over a steep slope, and rain runoff from the road was concentrated into weak places. Once the causes are in place, something has to trigger landslides. The trigger at this point in 2011 is a long wet season. Early heavy rains seep into the landslide mass and fill up its pore spaces. Later heavy rains overload it through two physical mechanisms. The first is simply the weight of the extra water, which tends to push everything downhill. The second is more important: the extra water raises the water pressure inside the pores of the landslide mass. That actively works to lift the mass, the way that stepping into waist-high water makes it harder to keep your footing. This can work at quite shallow levels, as this earthflow shows. 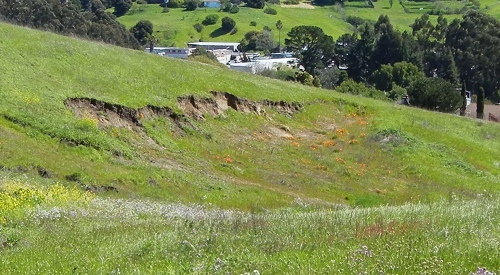 Notice the poppies in the newly exposed ground. Vegetation is very sensitive to these changes. In both of these simple examples you’ll see that the top of the slide is a scalloped shape; it’s called a headscarp. In the large, complex slide below the hillside was littered with them. Most of our landslides are actually old—they have moved previously, and this year the rains reactivated them. A practiced eye can readily pick out the resulting topography, which is hummocky rather than smooth. The photo below (click for full size) shows the whole length of a complex slide. On the right are scarps from activity in previous years. At the far left is the scar of an earthflow. On the crest, in the middle, is a brand-new headscarp from last week. And the landscape along the whole facing slope is hummocky, with different vegetation taking advantage of temporary high water tables. 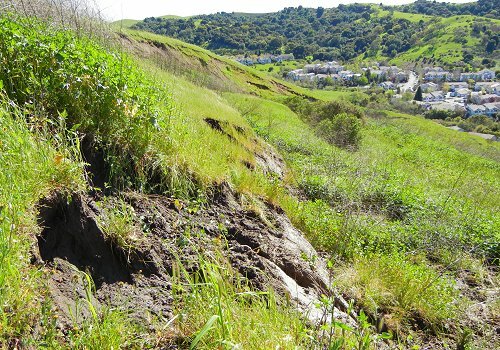 Learn more about landslides at these links.